Midsummer is fast approaching and all things Scandinavian are having a bit of a moment. As we continue to invest in the darker side of the Nordic psyche and in particular its dramatised crime fiction, I have toyed with the idea of writing something here about the manner in which ‘Midsommar’ is celebrated in that northenest part of our northern hemisphere; that place where the longest day is of especial cause for celebration because the opposing night in the calendar six months hence is so depressingly long. I could have followed this lead, and written of floral abundance, outdoor partying, gravadlax and crayfish, potato and beetroot and of dill and chive flavoured party food, all washed down with a little too much aquavit. I could have pointed out that Williams & Bunkell (aka Matt and Mark, or the fish boys if you prefer), in Claygate Parade, are a local blessing who, quite apart from the wet fish displayed so beautifully in their window, can also provide some pretty spectacular salmon based centrepieces for a Scandinavian themed Midsummer party. But the cook in me has been seduced, more recently, by a very different part of the world, one that boasts no thrilling whodunnit drama or iconic light fittings, and one that will not be celebrating Midsummer with quite such gay abandon but whose food, nonetheless, is entirely appropriate for entertaining during the warm evenings of the summer months. I am talking of Persian cuisine, a hidden gem, unlike any other you may have tasted. Not quite Middle or Far Eastern, this part of the world hinges those other two Easts together with its unique blend of flavours, techniques and ingredients. Persia is, of course, a bit of a euphemism - more romantic sounding than the modern name but the time honoured traditions surrounding Persian food are still very much a feature of modern day Iran. The word Persian refers to the wider culture attached to that place, a culture that has been influential on many others even as they have marched in as conquerors, admired its magnificence and submitted to its culinary superiority. Persia is a place of foodie richness; a vast and often beautiful landscape encompassing mountains and deserts and coastlines and ancient cities and all manner of history and regional custom, but what all Persian households have in common, above the shared tennents of their national cuisine, is an overwhelming generosity of spirit when it comes to looking after a guest or two. There is no typical progression of courses at the Persian table, they are more inclined to a spread of wide variety. They are fond of fresh herbs and dairy products and their stews and soups and koftas and kookoos offer a subtle balance of hot and cold, sweet and sour and of delicate spicing; bread is always at their table and, on high days and holidays so is their very special rice, plain or jewel studded, but sporting the tah deeg (crust), so prized that many are prepared to use a little guile to obtain a lion’s share. To sweeten the mouth at the end of the meal, desserts like we are used to are not well known, they have instead sumptuous sweetmeats or simple fresh fruit. We are lucky to have, just along the A3 at the Robin Hood roundabout, Suroor Market, a grocers full of Persian goodies: preserved exotic fruits, herbs, spices and vegetables, fresh flatbread and other produce, nuts and dates and ready made sweetmeats, labneh (thick, strained yogurt), cheese, olives - a veritable Aladdin’s cave of Eastern goodies - and so we have little excuse not to try this cuisine for ourselves if we would like to. You need to know your way around a little, but it is a pleasure to learn and the natives are inclined to be friendly and can tell you all you need to know about their ingredients even if we cannot always understand or agree on a name for some of them. For those of you not yet au fait with this particular cuisine here is a taster of the kind of herby freshness that the Persians do so well, an early summer version of the kookoo that I mentioned earlier. 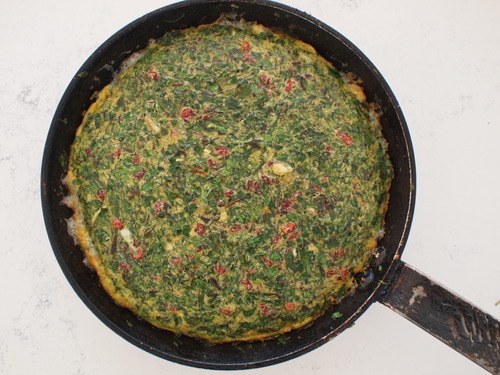 This is not dissimilar to an Italian omelette except that the Persians verge on the reckless where herbs are concerned; if you choose to add a few ruby red barberries to the mix, the decorative comes to the fore as does that slight sweet/sour zing so beloved of this demographic. A tasty, entry-level, lunch and picnic-friendly example of this majestic cuisine and, aside from a little effort washing and drying all those herbs, very quick and easy to make. I hope that you enjoy it. if using, soak the barberries in a little water; at the same time lightly crush the saffron and add a couple of teaspoons of cold water, set to one side. 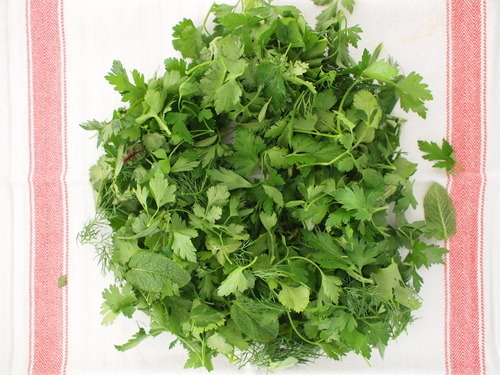 de-stalk all of the herbs, wash in a large basin of cold water, drain and dry, first in a salad spinner or tea towel, and then roll in a clean dry tea towel to dry the herbs completely. 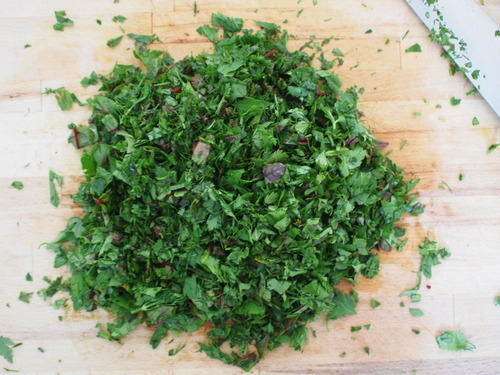 Chop the herbs quite fine and set aside. break the eggs into a large bowl and whisk together with some salt and pepper and with the saffron, and its liquid, and fenugreek, if using. stir in all the chopped herbs and spring onions and the drained barberries. heat a tablespoon or two of oil or a knob of butter over a medium heat in an oven-proof frying pan (no more than 24cm in diameter); the fat is hot enough when a test teaspoon of the mix starts to sizzle in it, pour all of the egg mix into the pan and turn the heat right down. cover the pan, cook until the omelette almost set (about 10 - 15 minutes), uncover, and brown the top under a hot grill or by sliding the omelette onto a large plate and putting it back in the pan, top side facing downward. cut into wedges and serve once the omelette has cooled a little, or at room temperature, with some bread and some salad.